Securing dependable janitorial services in Lincoln, Nebraska is simple when you call the experts at CleanLinc Cleaning Services, Inc. Locally owned and fully trained, our janitorial services have been keeping Lincoln offices clean and businesses shining since 2007. Our use of highly trained, hands-on supervisors and accessible management ensures that you will receive the best customer service and quality care for your janitorial needs in Lincoln. Small enough to understand that customer service is key, yet large enough tackle large janitorial jobs in Lincoln, janitorial services by CleanLinc Cleaning Services, Inc makes sense. We look forward to fulfilling your Lincoln janitorial service needs! 5★★★★★ - "Leroy from CleanLinc Cleaning Services, Inc has been great to work with. Him and his team are professional and do great work. 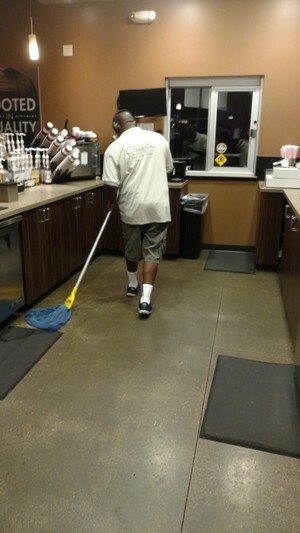 I would definitely recommend CleanLinc if you're looking for reliable commercial cleaning!" 5★★★★★ - "A clean store is essential to any business. We take great pride in the way our stores look and Leroy is a big part of that. We really value his services and dependability." 5★★★★★ - "I work at a business where CleanLinc won the renewal bid from one of the big name cleaning services. I can say there was a significant improvement after CleanLinc took over. Being a local, owner run business they have pride in their work compared to an employee going thru the motions to collect a paycheck!" 5★★★★★ - "Leroy is a Great man to work with and very understanding. I would highly recommend him for any job."